Tup's Indispensable | Global FlyFisher | Tup's Indispensable is a fly originated by R.S. Austin in 1890, utilizing a quite exotic material as dubbing. One of the most famous of all trout flies in the known universe is the "Tup’s Indispensable". And I hope that the story, behind this fly, will bring you a bit of nostalgia and a real, light sense of fly fishing as it did me. 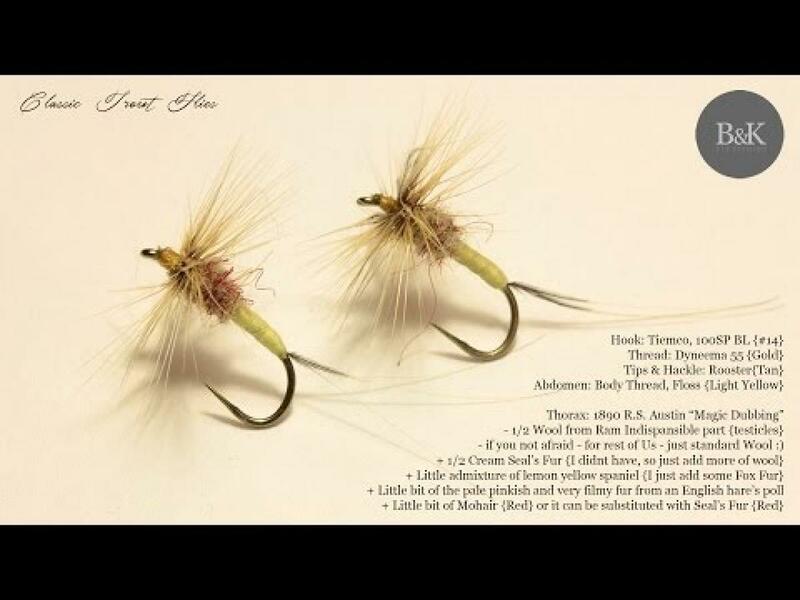 This fly, which is effective when trout are taking pale midges or mayflies, was created by the tobacconist and a part time professional fly tier R.S. Austin. It was sometime around 1890 in Tiverton, Devon, southwest England. The fly became so popular that Austin became utterly sick of tying it, and one of his customers said that the "Dorsetshire Frome"(river) stank of Tup's Indispensables from Maiden Newton(town) to the sea. The dressing for the pattern was kept a secret by Mr. Austin. G.E.M Skues the 1858-born British lawyer, author and fly fisherman, most noted for the invention of modern-day nymph fishing, together with another fly-dresser - Mr C.A. Hassam, and Mr. Austin's daughter. She also took over the fly tying business after her father's death, and continued tying and selling these "Tup's" with just a few minor changes - like changing the use of mohair and replacing it with red seal’s fur. Upon her retirement in 1934, Miss Austin gave permission to publish the correct dressing of Tup's Indispensable to G.E.M. Skues. ...I believe I was the first angler to use the magic dubbing. I was, at the time, in constant correspondence with Mr. R. S. Austin. The date I do not exactly recall, but, from a note in Mr. Austin’s handwriting describing its first use, I judge the date to have been June, 1900. He sent me a sample on a broken Limerick eyed hook, telling me that with it (the actual fly) he had killed at the mouth of the Loman, where it debouches into the Exe at Tiverton, in two or three successive evenings a number of big trout which the natives there counted uncatchable, one of them exceeding 5lb. another 3lb. 1 oz. another 21lb. and another about 2lb. Being naturally very much interested I asked Mr. Austin (in returning him the pattern) what was the nature of the dubbing, and he very generously not only gave me the prescription, but also sent me enough of the made-up material to dress a number of examples of the fly. I told Mr. Austin that I thought the fly deserved a title, and in his reply he asked what I suggested. I replied that there was 'So and So’s Infallible', 'So and So’s Irresistible', and so on – “Why not ‘Tup’s Indispensable? He said he did not care to name it and for the moment the matter dropped. The essential part of this dubbing is the highly translucent wool from the indispensable part of a tup, thoroughly washed and cleansed of the natural oil of the animal. This wool would by itself be, like seal’s fur, somewhat intractable and difficult to spin on the tying silk, but an admixture of the pale pinkish and very filmy fur from an English hare’s poll had the effect of rendering it easy to work. There was also in the original pattern an admixture of cream coloured seal’s fur and combings from a lemon yellow spaniel, and the desired dominating colour was obtained by working in a small admixture of red mohair. For the mohair I generally substituted seal’s fur, and I believe Mr. Austin did so himself. When wet the Tup’s wool becomes somehow illuminated throughout by the colour of the seal’s fur or mohair, and the entire effect of the body is extraordinarily filmy and insect-like. However using fur from the ram's testicles wasn't really new idea. The first use of this material goes to Alexander Mackintosh in the book The Driffield Angler, 1806. He suggests, "Take a little fine wool from the rams testicles, which is a beautiful dusty yellow..."
Now compere this to a family business secret lasting 44 years, which actually meant "ram's balls". It makes a ghost of a smile grace my lips. And for a moment I just tried to travel back to the days when, I believe, people may have had a harder life, but a much greater sense of humor. 1/2 Wool from a ram’s indispensable part, the testicles, if you are not afraid. For the rest of us just standard wool, 1/2 cream seal’s fur. Or just add more wool. A mixture of lemon yellow spaniel. Alternatively you can use fox fur. A bit of the pale pinkish and very fine fur from a hare’s mask. A bit of red mohair or red seal’s fur. Here is the true and authentic pattern. It is too much to hope that at last we may now see the true patterns on sale in the tackle shops?